Just ordered one of these. The Sainsburys web site doesn't offer any customer reviews but on Tesco's it has 11 reviews and is just over 4 stars by the look of it. Seems a good deal if you fancy a kitchen gadget. The Gordon Ramsay Multi Blender means you can turn your hand to blending or juicing as well as chopping and grinding. 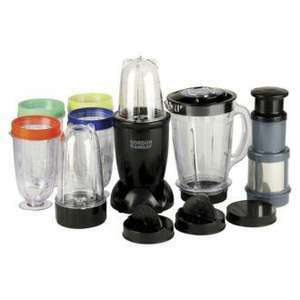 The multi blender comes with a cross blade, a flat blade and a juicer attachment. The cross blade is ideal for chopping veg, blending smoothies and milkshakes, mixing batters and dough, grating chocolate and cheeses, pureeing soups and baby food and grinding meats, while the flat blade is perfect for grinding and chopping harder ingredients such as nuts and dried food. To get the freshest possible juice attach the juicer attachment! The multi blender comes with a tall and short cup, plus four serving beakers with lids, plus two re-sealable lids and two sprinkler lids. All the removable parts are dishwasher safe and there are even a couple of recipes included. Comes with a manufacturer's two-year guarantee. This looks like a copied version of the magic blender which I bought several years ago. Exactly the same attachments and design. Seems like a good deal. Only hesitation based on reviews over at Tesco is that there is no on/off button on the blender and you need to use the wall socket switch. Not a thoughful design. Still tempted at this price. Heat added. its true .... i bouht this blender from reader digest.it,s wasting of money. We have the bullet version and use it numerous times a day. Wouldn't be without it. For when you feel like blending Gordon Ramsey. 250 watts motor for this price....not a good one. I don't know! I'm just a cat! I can't read! I bought one of these from Amazon (Hinari Genie as someome already pointed out) when they were just under £20. I have found it to be very suitable for my means, it blends fruit, nuts and veg just fine. I don't do all the extravagent stuff they do in the video adamuk82 posted, but it suits my needs. I don't know much about blenders but I've had mine for 2 years now and it's very reliable. Oh yes, it doesn't have a button, you just push the container down to activate it and if you have to leave it for a while, you just twist it slightly so it clicks into place. Works very effectively and never had a problem with it. Juicers on the other hand I am quite a snob about! Just collected mine but i am a little bite disappointed by the quality. I will never paid full price for this. Why not get a good quality glass jug blender? The motors on those start at something like 600W (3x the power of this) and the glass gives a more neutral taste and is more easily cleaned without getting the plastic mist effect. Whatever you want to blend put it in and blend then empty and blend with water to clean before putting the next lot of ingredients for the next part of your cooking. Why do you need all those extra parts that will have to be stored or lost. This looks like a copied version of the magic blender which I bought … This looks like a copied version of the magic blender which I bought several years ago. Exactly the same attachments and design. Like you thought Gordon the f*** Ramsey made some kind of contribution to this design. Most low end products are made by one manufacturer. Seems like a good deal. Only hesitation based on reviews over at Tesco is … Seems like a good deal. Only hesitation based on reviews over at Tesco is that there is no on/off button on the blender and you need to use the wall socket switch. Not a thoughful design. Still tempted at this price. Heat added. it switches on automatically when u push the top down, stops when you let go, these things are the quickest and best little blender i have ever used, dont bother juicing with it though, that bit is rubbish. Ordered thanks. It will be useful if only for smoothies and milkshakes as my last one was rubbish.